Just one day after Citigroup wowed Wall Street with solid quarterly earnings, CEO Vikram Pandit said Tuesday he is stepping down, ending his tumultuous five-year reign atop what's been deemed the world's financial supermarket. The surprising shakeup came as Pandit's 2011 compensation remained a sticking point for shareholders, who earlier this year voted against his $15 million pay package -- an issue Citigroup's board of directors has yet to publicly address. With Pandit's departure, Citigroup's board named Michael Corbat, a 29-year veteran of the bank, as the new CEO. Corbat most recently headed Citigroup's operations in Europe, the Middle East and Africa. Prior to that assignment, he served as the head of Citi Holdings. Citi Holdings was the unit that held the bank's so-called bad mortgage assets, which it has been slowly selling off since early 2009. Corbat helped facilitate the sale of more than $500 billion of troubled assets, according to Citigroup. Citigroup's president, John Havens, also resigned on Tuesday. Havens had been expected to retire by year's end, but he accelerated his plans once he was aware of Pandit's timing, a source close to the bank said. Citigroup Chairman Michael O'Neill said on Tuesday that Pandit announced his resignation, and the board accepted. "In contrast to speculation, there's no strategic, regulatory or operating issues that precipitated his resignation," he added. Moody's affirmed its rating on Citigroup following the news but downgraded the firm's ratings outlook from stable to negative, citing the risk that "this unexpected management change will negatively affect Citigroup's ongoing efforts to install improved risk management practices throughout the firm." Citigroup is the world's third largest bank by assets, following only JPMorgan Chase (JPM) and Bank of America (BAC). Citigroup (C)'s shares closed 1.5% higher. On Monday, the bank's stock had rallied more than 4% after the bank announced third quarter results. Its shares are up 39% this year. "Mike is the right person to tackle the difficult challenges ahead," Pandit said in a statement. "Citigroup is well-positioned for continued profitability and growth, having refocused the franchise on the basics of banking." Sheila Bair, the former head of the FDIC, praised Corbat and called the bank's decision to elevate him a "positive sign that the board is taking responsibility." In her recently released account of the financial crisis, Bull By the Horns, Bair called Pandit a "poor choice" to "clean up the mess at Citigroup." Corbat also drew plaudits from Sandy Weill, the man who created Citigroup by buying up and integrating a host of banks and brokerage firms during the 1990s and early 2000s. "I know Mike Corbat very well, " Weill wrote in a statement. "He will be a good leader for the team in the future." Pandit's time at Citigroup has been marked by seemingly unending drama and a nearly 90% drop in the company's share price. While the stock prices of all major banks are down from before the crisis, Citigroup's stock has fared worst. Most recently, shareholders voted down his $15 million pay package from 2011. On Monday, the bank's executives declined to comment on what steps the board would take to change Pandit's compensation. He had already received $7 million in cash, and had $8 million due in restricted stock and cash. A bank spokesperson declined to comment on the issue Tuesday. Pandit inherited a troubled bank at the end of 2007. His predecessor, Chuck Prince, had aggressively sought to increase Citigroup's market share in subprime mortgages and housing, ignoring signs of trouble in the market. 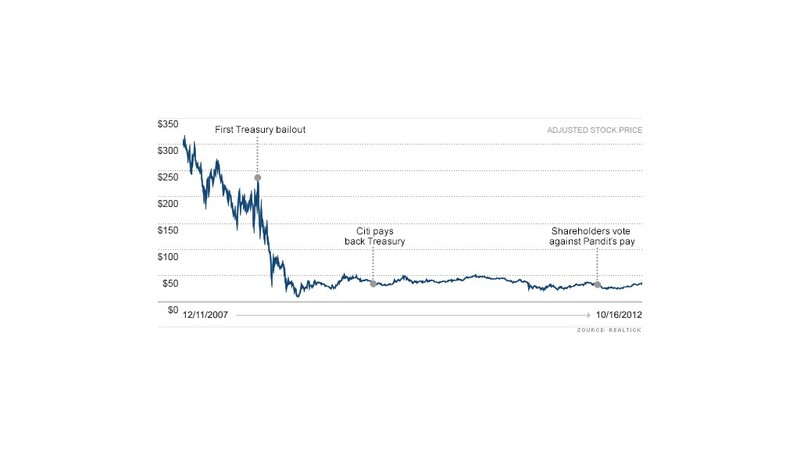 Nine months into Pandit's tenure, in October 2008, Citigroup was forced to take roughly $48 billion in funds from the Treasury Department to stay afloat. Citigroup was ultimately one of the largest recipients of TARP bailout funding. The board's announcement Tuesday was particularly surprising to investors because Monday's report on third quarter earnings offered a preview at what a healthy Citigroup could look like. Unlike other bank CEOs, such as JPMorgan's Jamie Dimon, who have recently made bullish comments on the housing market, Pandit and his CFO were more wary.